Starting from Platis Gialos, we cruise towards Naxos Island, a place of exceptional beauty and remarkable tradition. Naxos Island is amongst the most famous summer destinations, as it offers a wide variety of beaches for all tastes and is considered to be the windsurfers’ hot spot. Agios Prokopis is the most famous beach on the island. Its most distinctive characteristic is the fine, thin white sand which forms sand dunes near the ending of the beach. Sometimes, herons reach the shore and refuge at a special spot on the beach, called “aliki” or the “red lake”. Due to its position, Agios Prokopis is protected from the winds especially towards its northern end, where a great rock blocks the waves from the upper side of the islands’ coast, offering its visitors a serene swim on windy days. The Chapel of Agios Prokopis is situated at the entrance of the beach with a magnificent view of the open sea. Plaka is the continuation of Agia Anna beach with a beach extending for 4 km. Plaka was the hippie spot during the ’70s with crystal blue Aegean waters. Right at the opposite of Plaka beach there is a small island called “Glaronisi” (seagull island”), the unique spot where cormorants gather. Plaka is ideal for a calm and quiet swim. Kastraki is the extension of Mikri Vigla. It is a 3km long sandy beach and the perfect choice for tranquility and relaxation. It is not organized but one can find a few taverns. Our cruise continues towards Koufonissia. 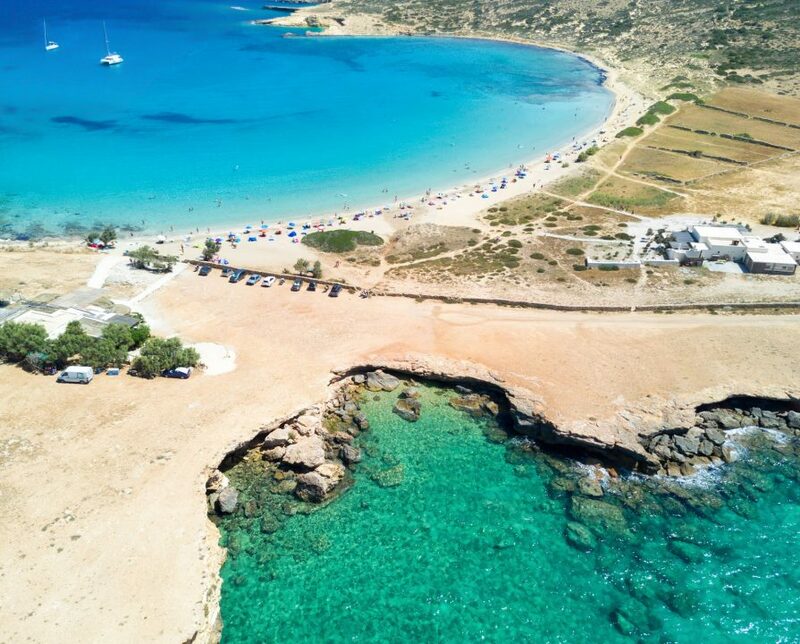 Koufonissia attractions include their stunning natural scenery, mostly arid but astonishing, along with sightseeing sites like places of archaeological importance and, of course, marvelous exotic beaches. Pano Koufonissi: There is a population of 440 permanent inhabitants, mainly engaged in fishing and tourist activities, while farming and animal breeding serve mainly household needs. However, the island’s fishing fleet, considered in proportion to the size of its population, is one of the largest in Greece and fresh fish and seafood delicacies are sure to tempt you.